Egypt's Jewish community celebrated on Sunday the Jewish New Year of Rosh Hashanah in Cairo at Adly Synagogue. 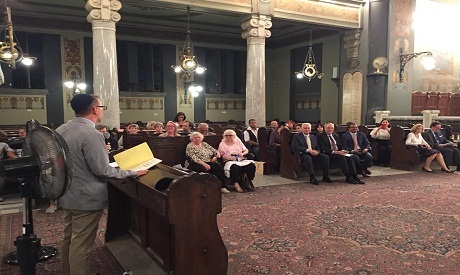 Members of the Egyptian Jewish community, headed by Magda Haron as well the foreign Jew expats, also attended the celebration marking the start of Jewish year 5779 at the Sha'ar Hashamayim Synagogue, which is commonly known in Egypt as Adly Synagogue. Egyptian and foreign public figures attended the event, including former leader of Egypt’s Social Democratic Party Moahmed Abu El-Ghar, author Ashraf El-Ashamaway, and current French ambassador to Cairo Stephen Routier, along with other foreign diplomats in Cairo. According to Magda Haron in previous media statements, there are fewer than 10 Egyptian Jews still living in Cairo. According to historical estimates, at least 60,000 Egyptian Jews left Egypt following the Arab-Israeli wars in the region starting in 1948.